Glenn Garrett awards Dan Weesner with his Poker Run CASH winnings! Dan Weesner won the first place prize for the best poker hand at tonight's Poker Run! Dan won $224 in cold, hard, CASH! Congratulations, Dan! Mr. 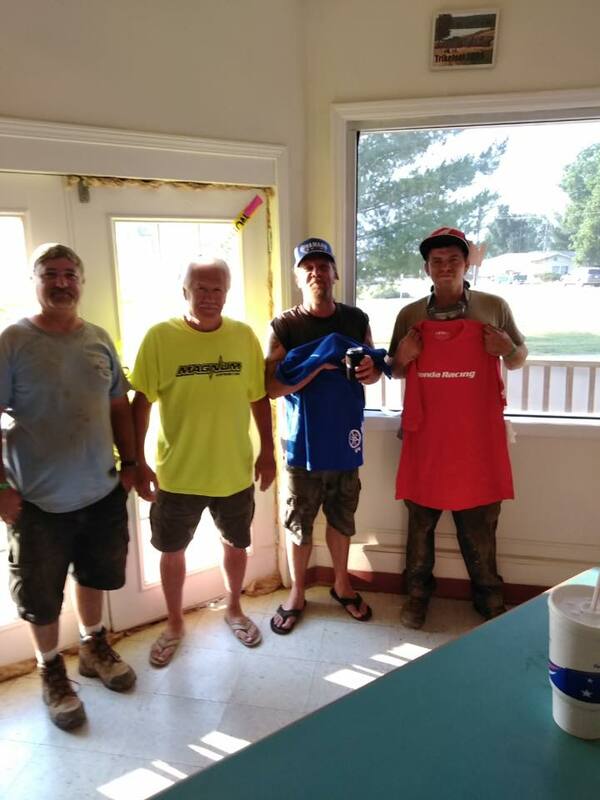 Skids donated some nice, quality Yamaha and Honda hats and t-shirts for the 2nd and 3rd place winners in tonight's Poker Run! 2nd place winner was Doug Hewitt and 3rd place winner was Dillan Nadzan! Congratulations, Doug and Dillan! Glenn awards Teresa the winning jackpot for the best poker hand in our Poker Run on October 28th! 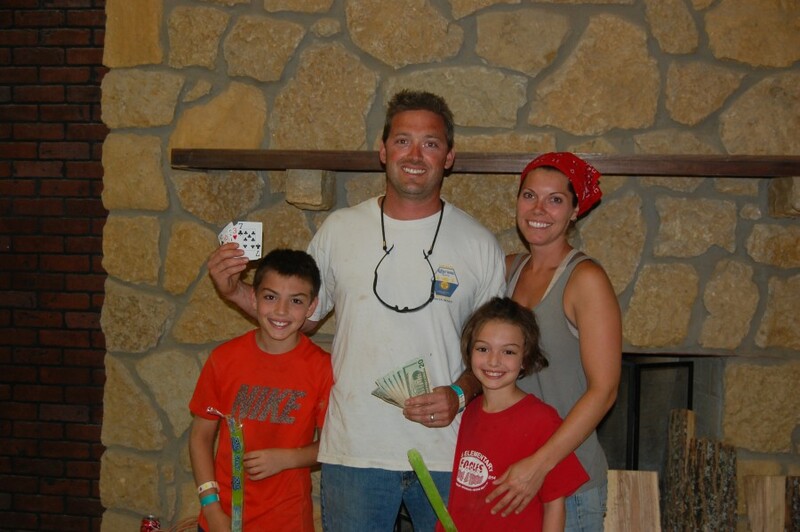 Teresa Garrett collected the best poker hand of all during our Poker Run on October 28th! She won $196 in cold, hard CASH! Congratulations, Teresa! Mr. 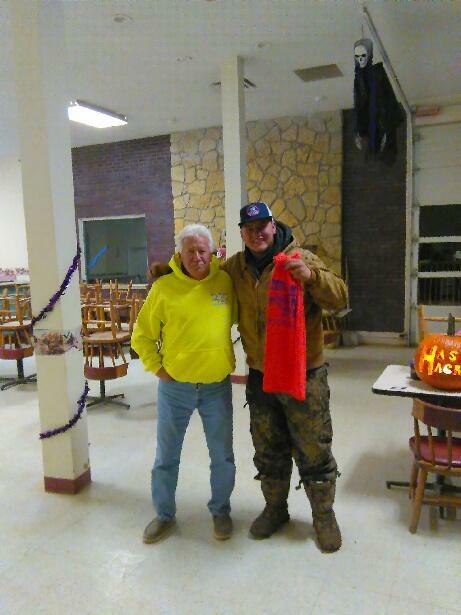 Skids awards Kyle with a new hat and t-shirt for his winning poker hand during our Poker Run on October 28th! Kyle Arkenau won a new hat and t-shirt from Mr. Skids for having the second best poker hand in our Poker Run on October 28th! Congratulations, Kyle! 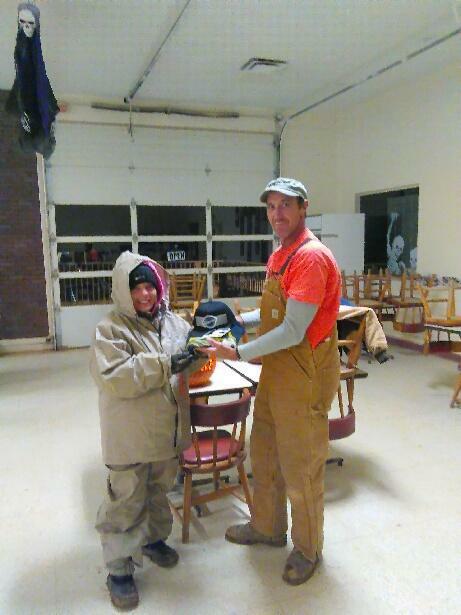 Glenn awards Dee Blankenship a new hat and t-shirt donated by Mr. Skids for her winning poker hand in our Poker Run on October 28th! 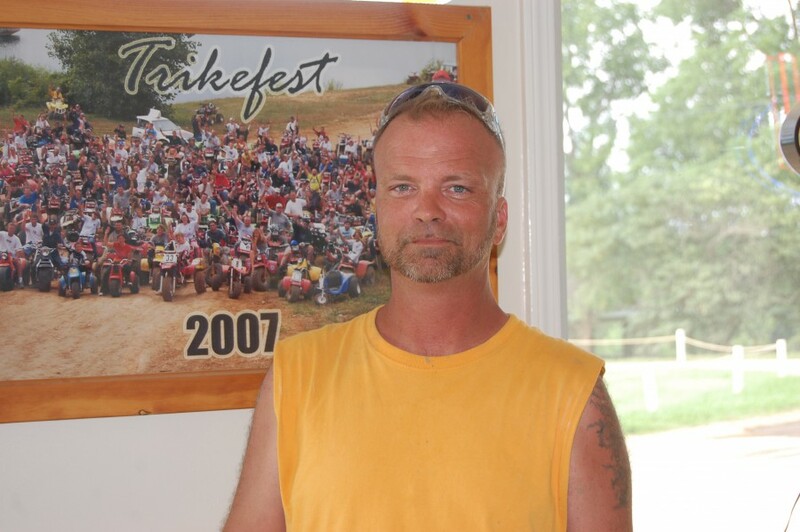 Dee Blankenship collected the third best poker hand during our Poker Run on October 28th! She won a new hat and t-shirt donated by Mr. Skids! Congratulations, Dee! 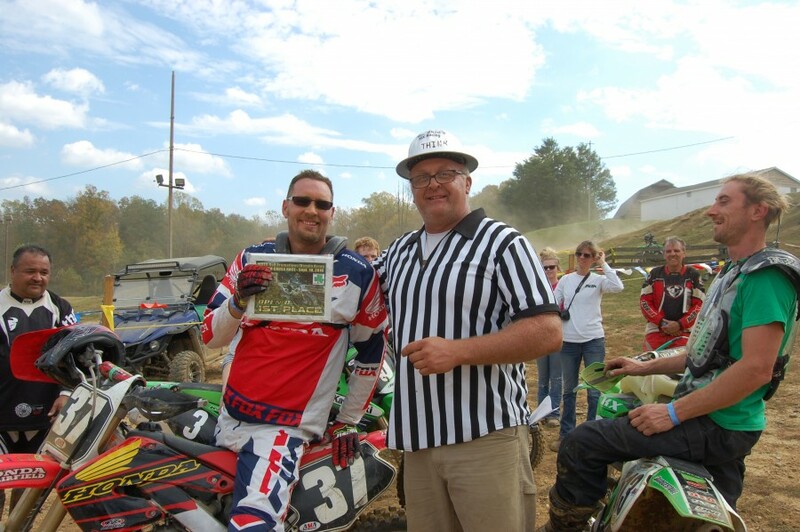 Patrick Bruner won 1st Place in the Vets 50+ class of our Halloween Motocross Race today! Lookin' good, Patrick! Congratulations! 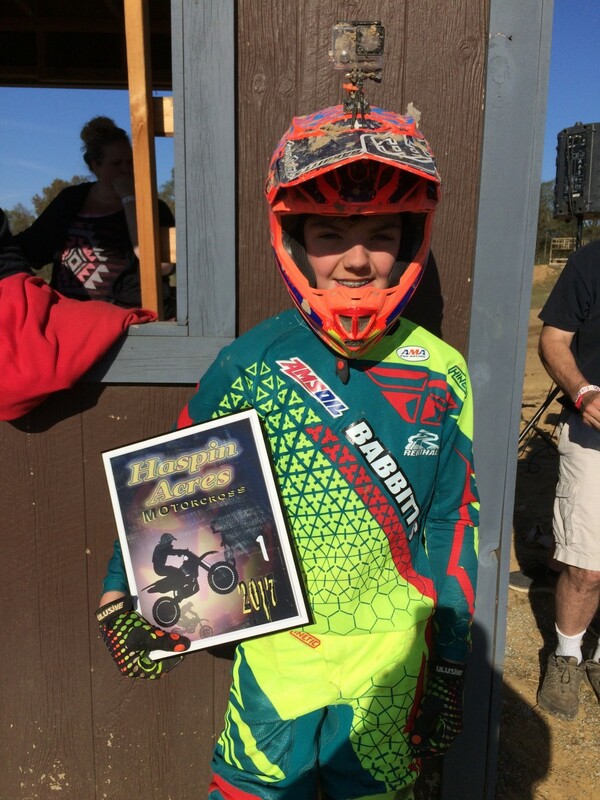 Brac Weir won 1st Place in the Junior Mini class of our Halloween MX Race today! Good job, Brac! Congratulations! 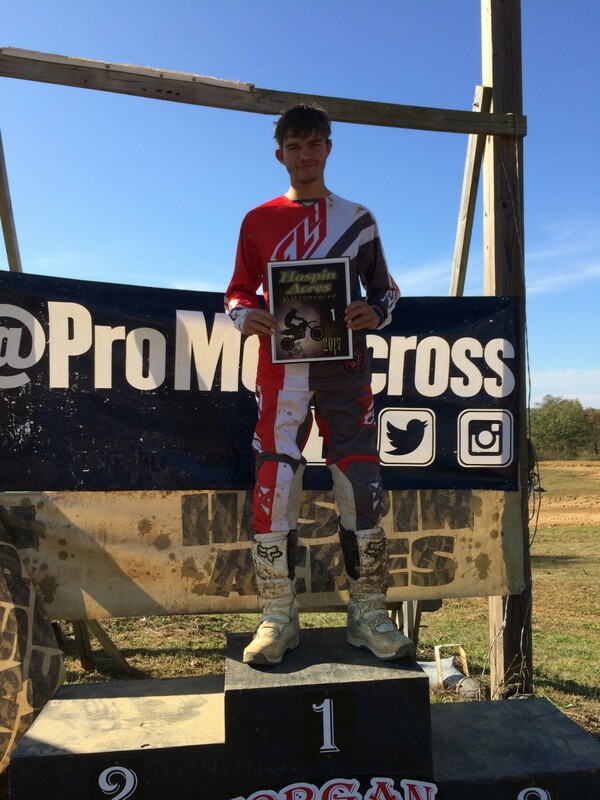 Levi Sellers won 1st Place in the Amateur Quad class of our Halloween MX Race today! Congratulations, Levi! Good job! 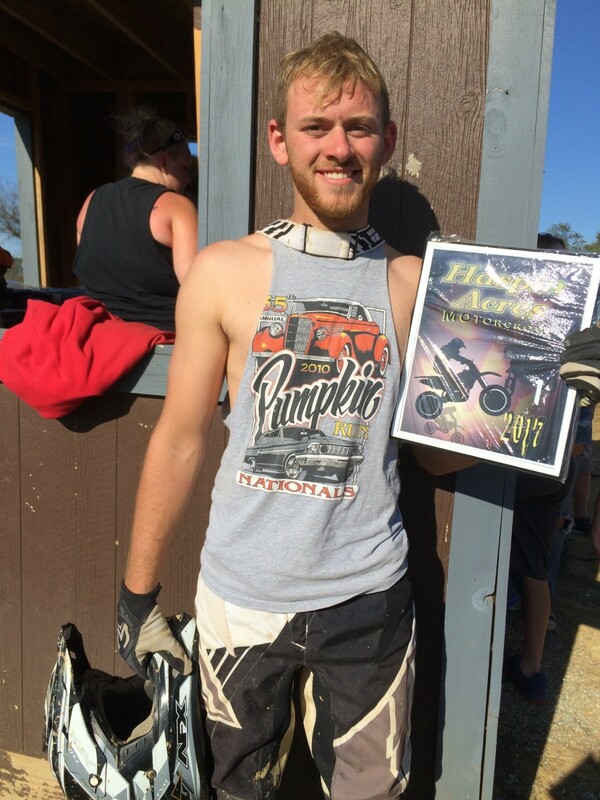 Joe Davis won 1st Place in the Open D class of our Halloween MX Race today! Excellent job, Joe! Congratulations! This dude here is THE MAN! 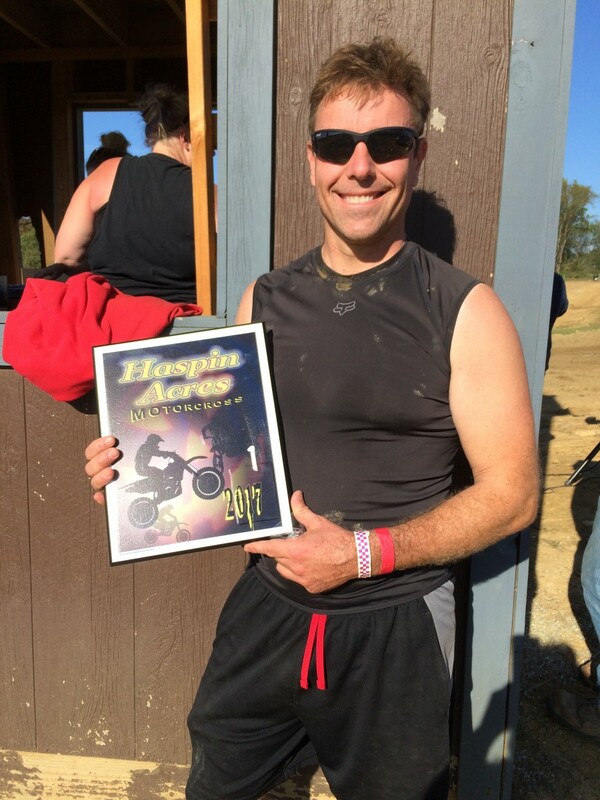 Brett Heidorn won 1st Place in BOTH the Senior Mini class and the Super Mini class of our Halloween Motocross Race today! Congratulations, Brett! Awesome job! 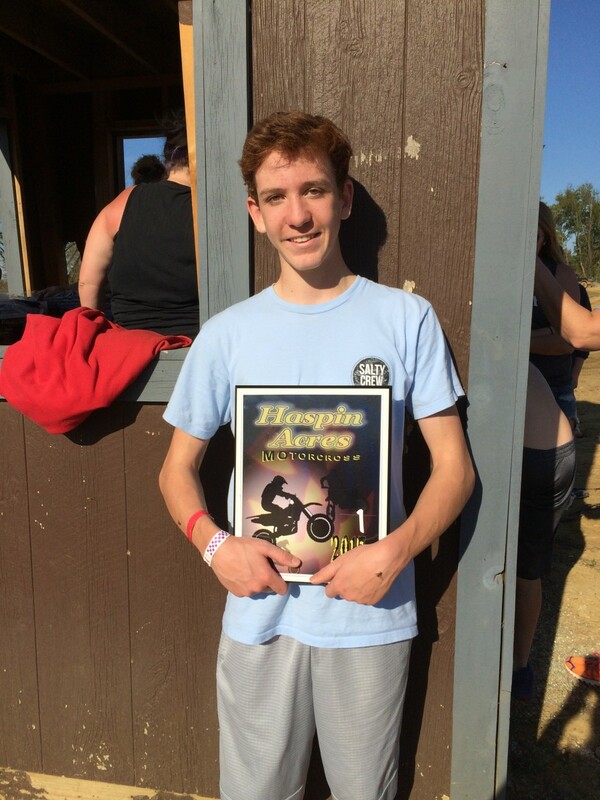 Jonathan Buhler won 1st Place in the Lites Beginner D class of our Halloween Motocross Race today! Great job, Jonathan! Congratulations! 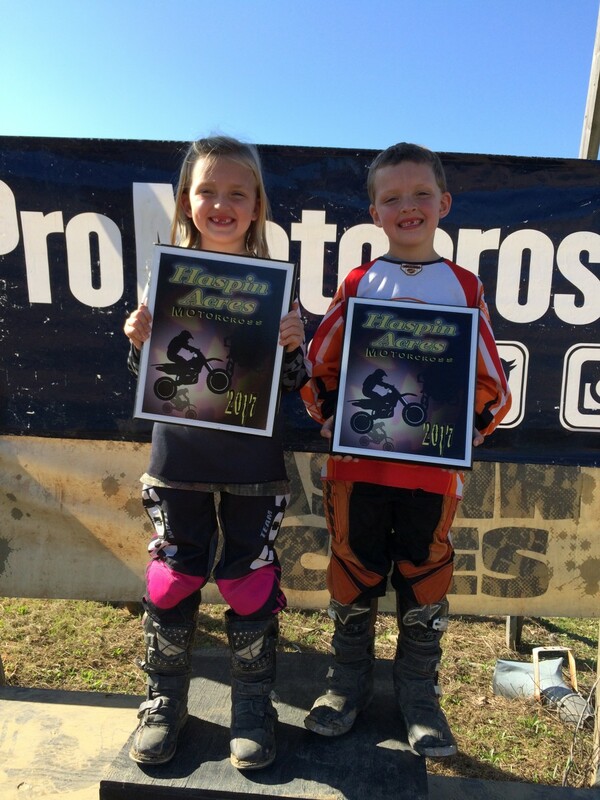 Teegan Selby (left) won 1st Place in the 90cc Quad class, and Colton Selby (right) won 1st Place in the Senior 50cc class of our Halloween Motocross Race earlier today! Congratulations you two! Teresa Garrett receiving her CASH winnings! 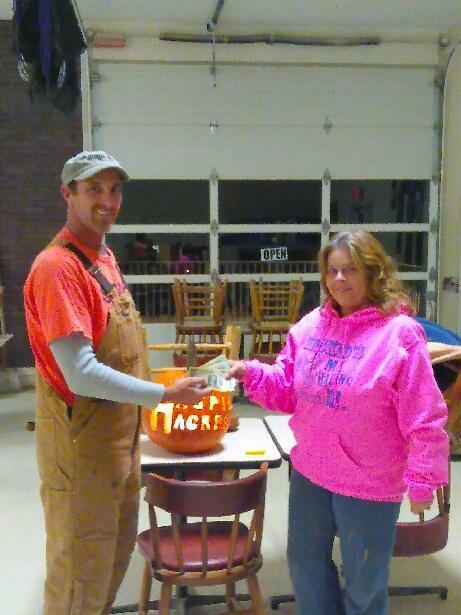 Teresa Garrett had the winning poker hand tonight in the Haspin Acres Poker Run! Teresa won $308 in cold, hard CASH! Congratulations, Teresa! David Padgett with his prizes from Mr. Skids! David Padgett had the second best poker hand in tonight's Haspin Acres Poker Run. David won a really cool hat and t-shirt, courtesy of Mr. Skids! Thank you, Mr. Skids, and congratulations, David Padgett! 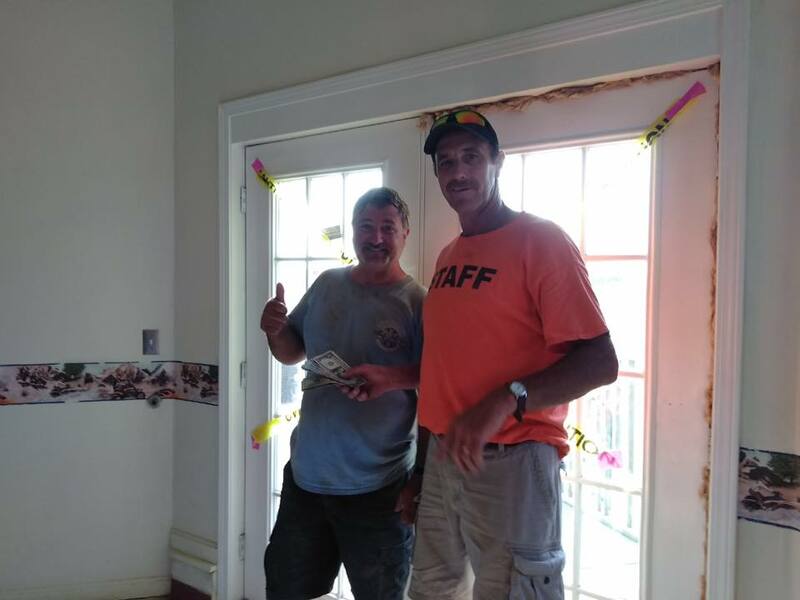 Isaias Baca collected the best poker hand and won $630 CASH in our Poker Run on August 19th! Congratulations, Isaias! Cody Thomas was the 1st Place winner in two categories this year in our Jamboree Weekend Show & Shine competition! Cody's sweet Chevy Silverado won top honors in the Best Paint Job and Best in Show categories! Congratulations Cody! 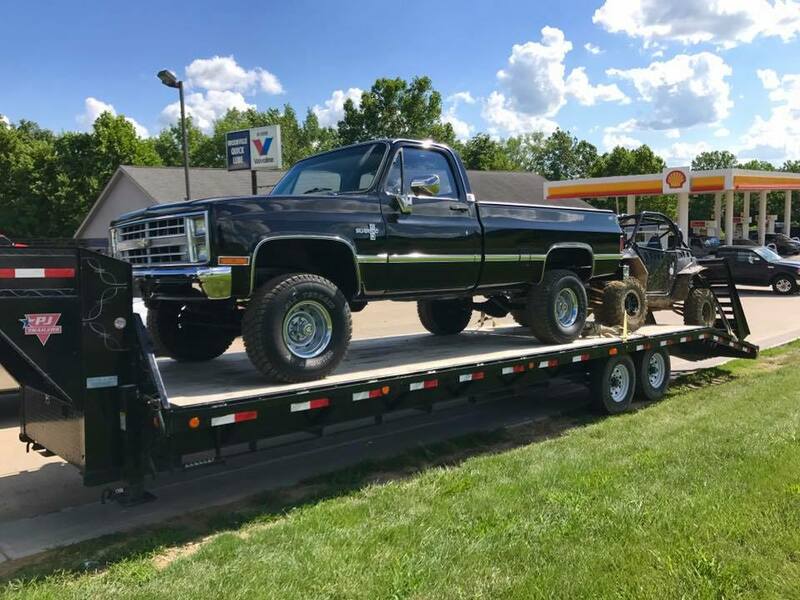 This is Cody Thomas's winning truck! He won 1st Place in the Best Paint Job and Best in Show categories of our Show & Shine competition with this sweet ride! Congratulations Cody! 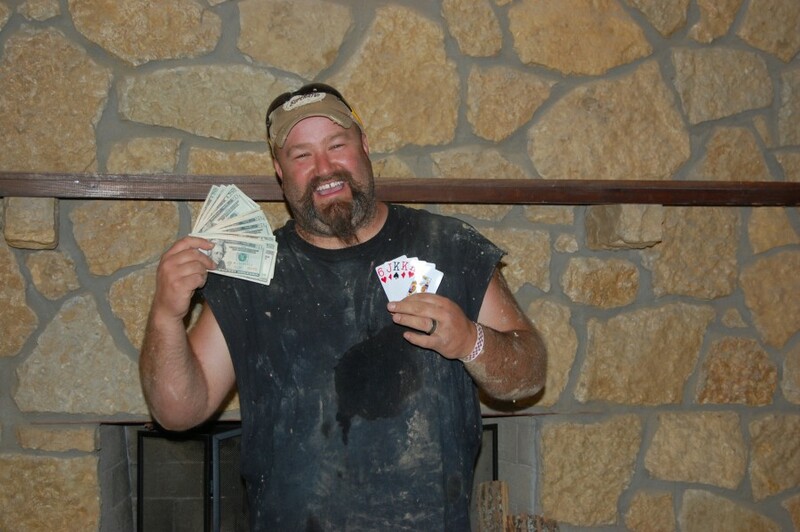 Greg Johnson with his winning Poker hand and his CASH winnings! 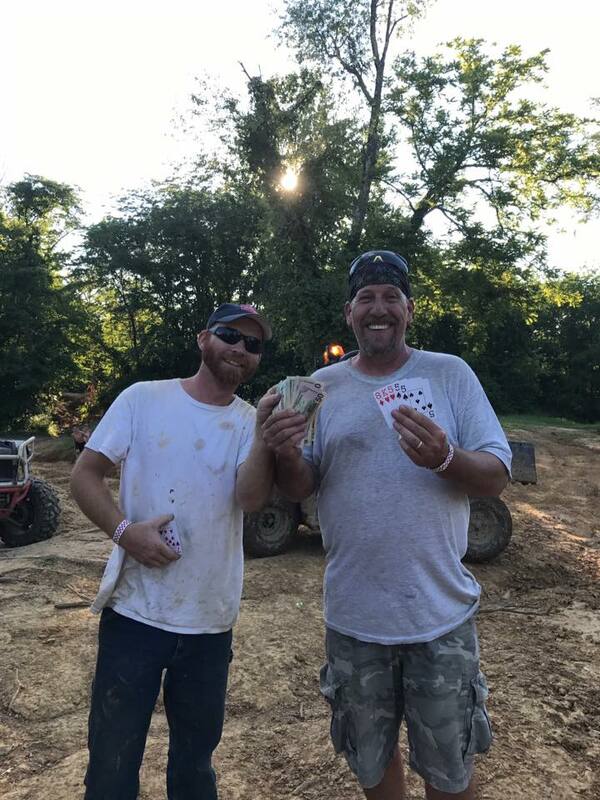 Greg Johnson ended up with the best Poker hand of the night during our Jamboree Weekend Poker Run! 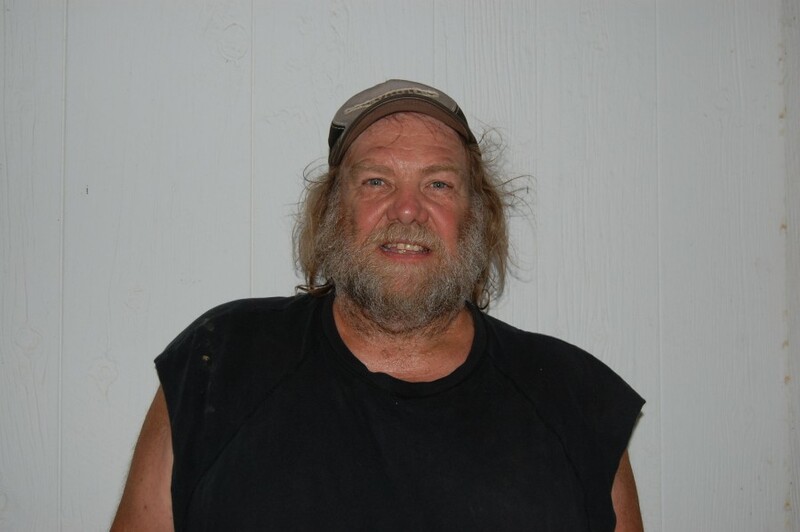 Greg won $392 in COLD, HARD CASH! Congratulations, Greg! 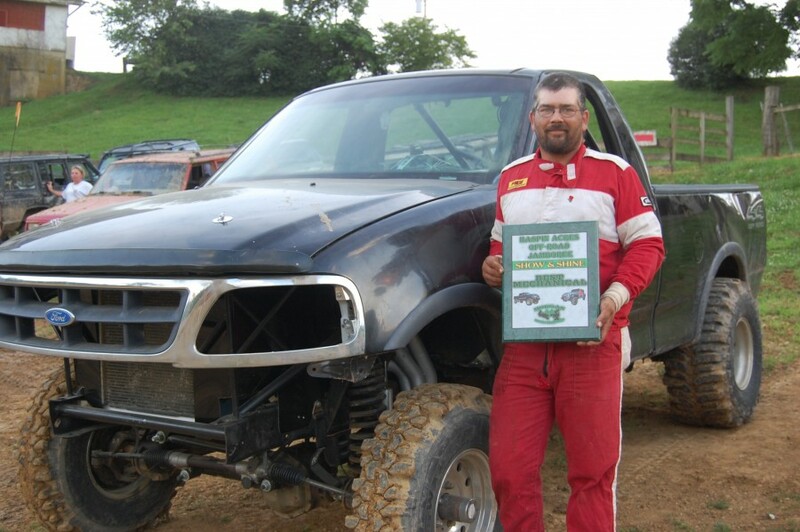 Tony Howard won 1st Place in the Truck Class of our Jamboree Weekend Mud Bog Race with the furthest distance through the Eliminator Pit! Tony won $60 CASH! Congratulations, Tony! 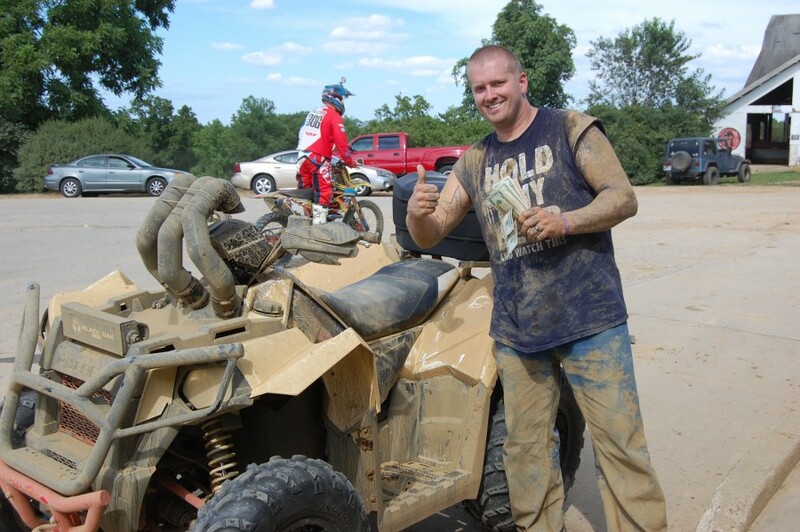 Quinton Foster won 1st Place in the UTV Class of our Jamboree Weekend Mud Bog Race with a winning time of 6.12 seconds! Quinton won $70 CASH! Congratulations, Quinton! 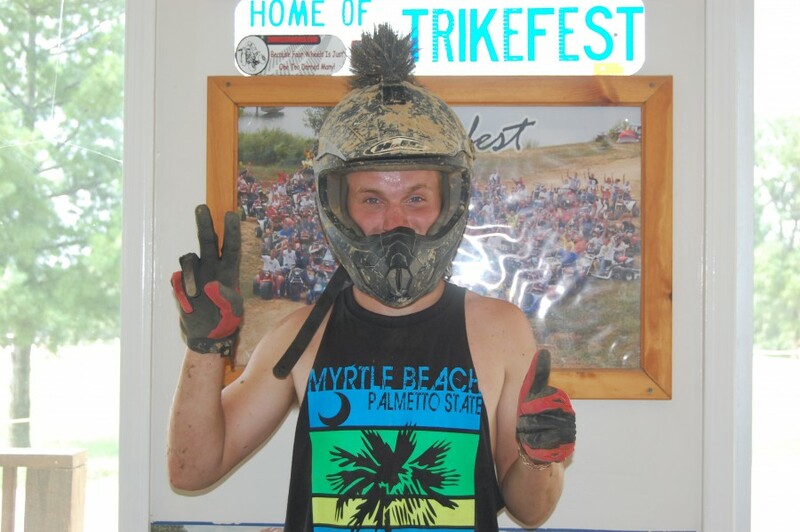 Dane Bulcher won 1st Place in the ATV/Quad Class in the Jamboree Weekend Mud Bog Race today with a winning time of 6.75 seconds! Dane won $90 CASH! Congratulations Dane! 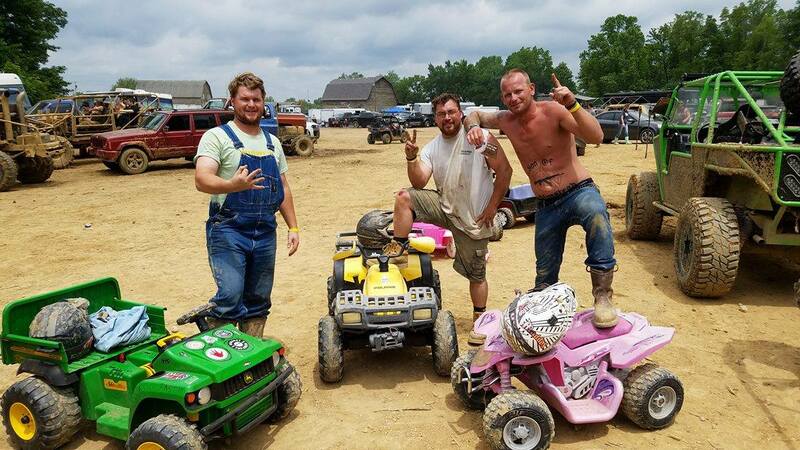 Dylan Olmsted, Brad Sansony, and Matt Bartlett won 1st, 2nd, and 3rd Place, respectively, in the First Annual Memorial Day Weekend Power Wheels Downhill Race put on by Amber Reams, Ryan Logsdon, and Eric Tillison! Congratulations Dylan, Brad, and Matt! Jeremiah Aigner with his CASH winnings! Jeremiah Aigner had a pair of Aces that was the best Poker hand in tonight's Poker Run! Jeremiah won $224 CASH! Congratulations, Jeremiah! John Allen won 1st Place in the Truck Class of our Outlaw Drag Race today! John won $60 CASH! Congratulations, John! Greg Wright with his prize winning Raptor 700! Greg Wright won 1st Place in the Quad Class of our Outlaw Drag Race today in his Raptor 700! Greg won $60 CASH! Congratulations, Greg! 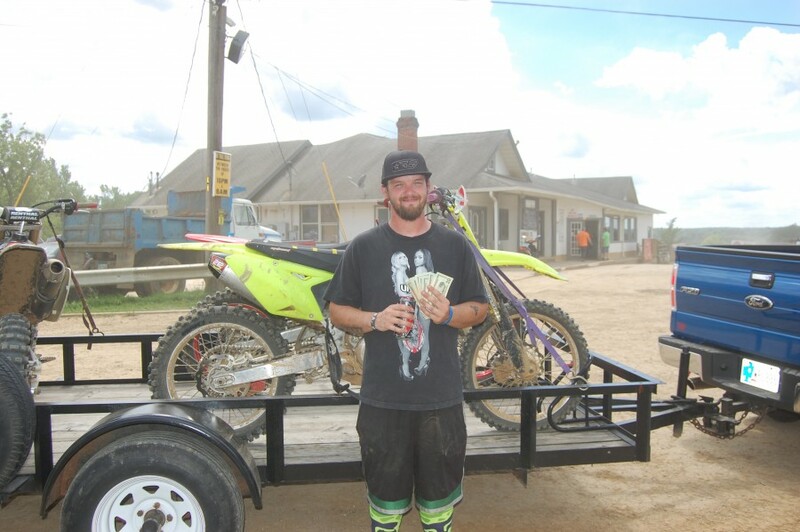 Nick Holmes won 1st Place in the Open "C" Class of today's Enduro Cross Race! 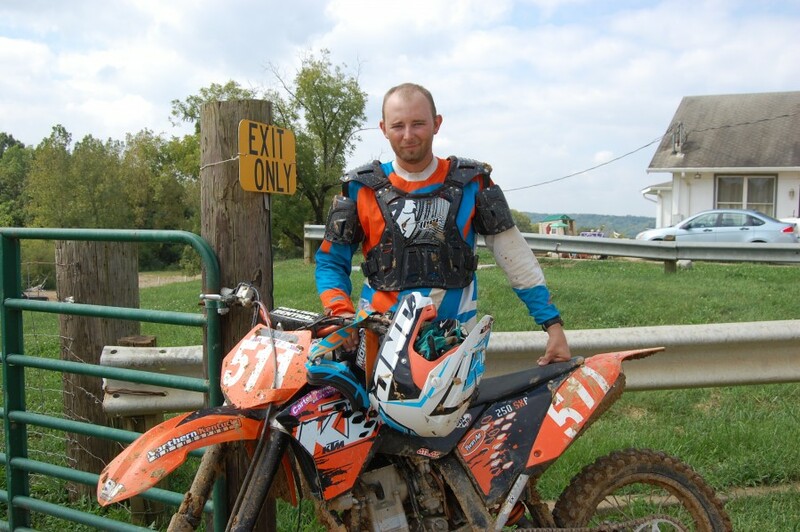 Chad Christy won 2nd Place in the Open "C" Class of today's Enduro Cross Race! 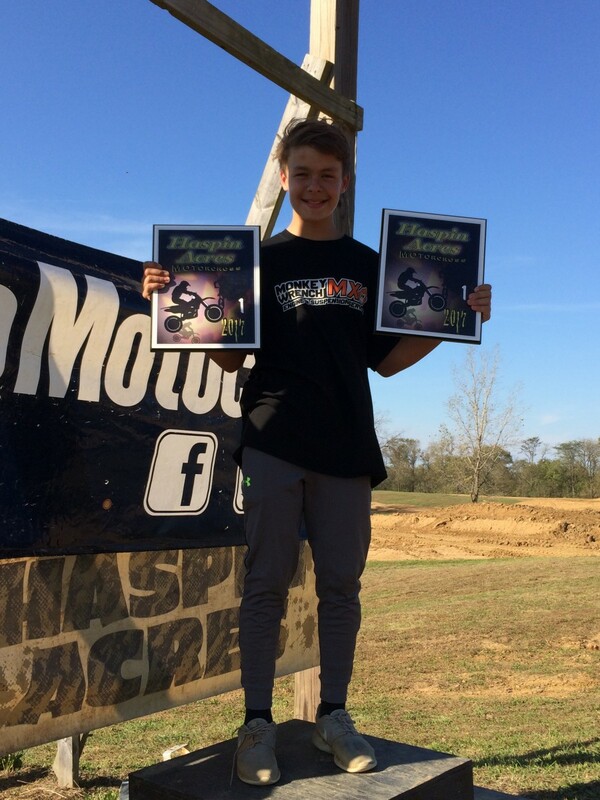 Clayton Richter won 3rd Place in the Open "C" Class of today's Enduro Cross Race! 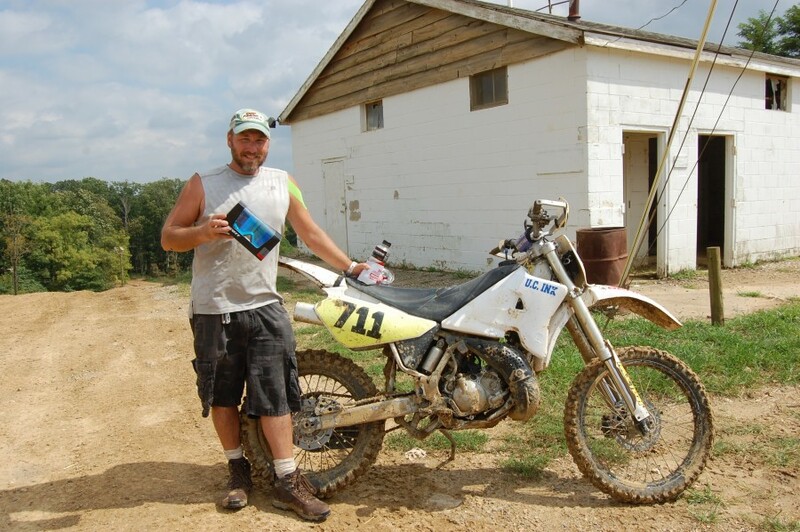 Jeff Atherton won 1st Place in the 40+ Class of today's Enduro Cross Race! Manny Barbosa won 2nd Place in the 40+ Class of today's Enduro Cross Race! Doug Gall with his sweet ride and CASH winnings! 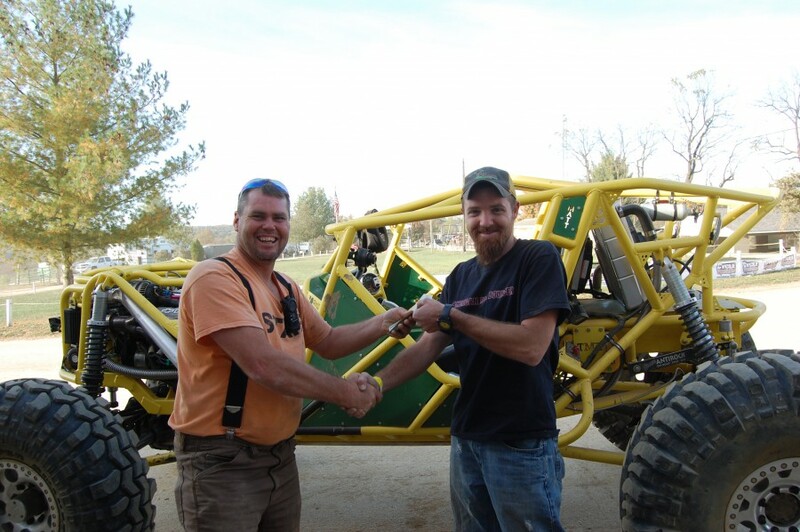 Doug Gall won 1st Place in the Rock Bouncer Class of our Hill Climb Race today and was awarded $1,500 CASH! Brian Henderson with his prize winning ride and cold, hard, CASH! 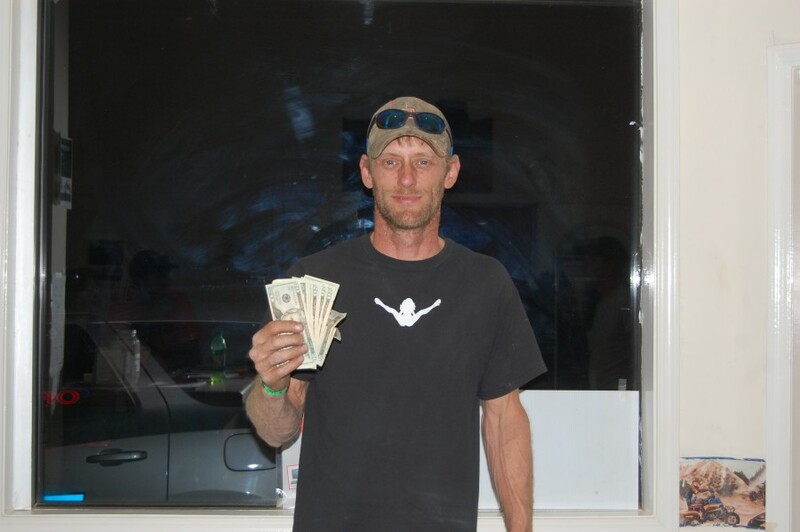 Brian Henderson won 1st Place in the Stock Truck Class of our Hill Climb Race today and was awarded $500 CASH! 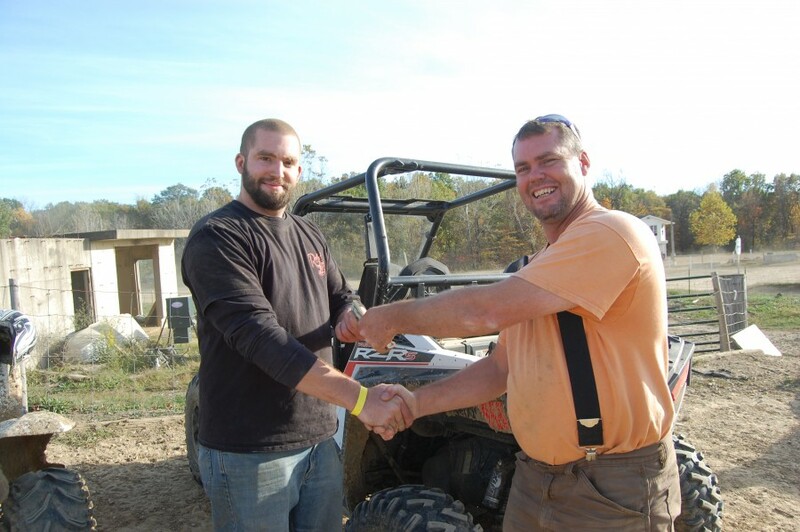 Colby Ryan (left) won 1st Place in the UTV Class of today's Hill Climb Race and was awarded $300 CASH! 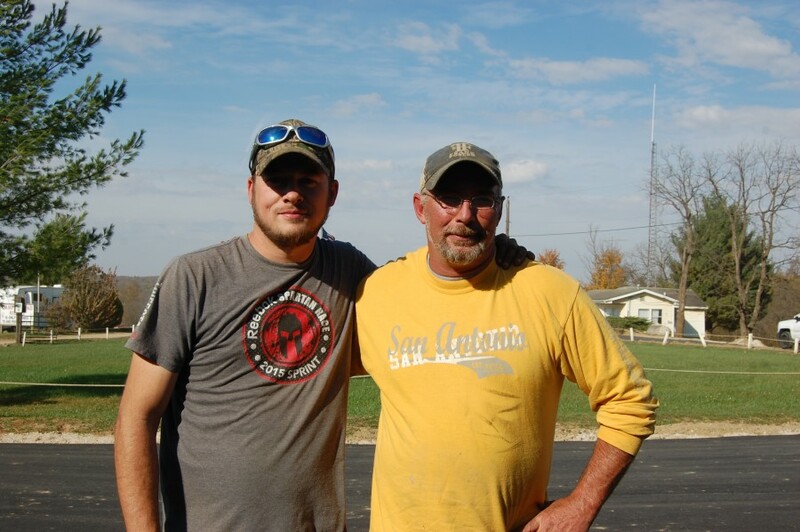 James Cantrell (right) won 2nd Place in the Rock Bouncer Class of today's Hill Climb Race and was awarded $500 CASH! 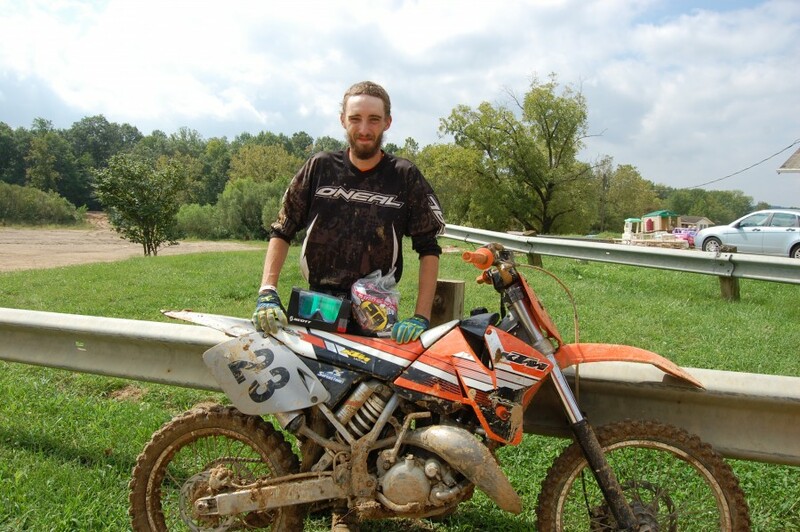 #0 Ben Baker won 1st Place in today's Enduro Cross race! 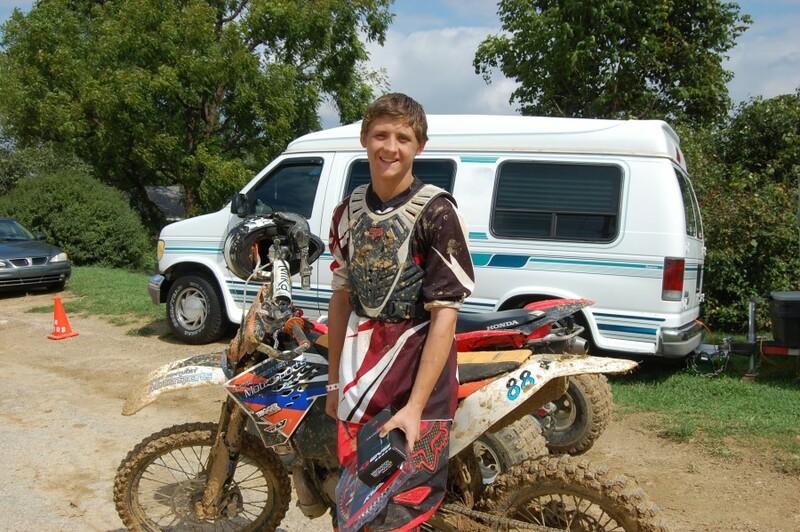 #88 Jacob Niesen won 2nd Place in today's Enduro Cross race! 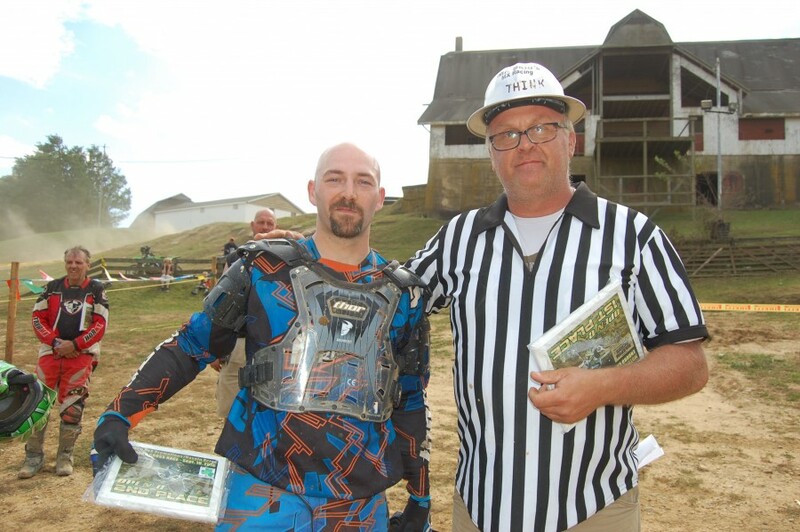 #511 Sean Barber won 3rd Place in today's Enduro Cross race! #212 J.J. Thacker placed 4th in today's Enduro Cross race! 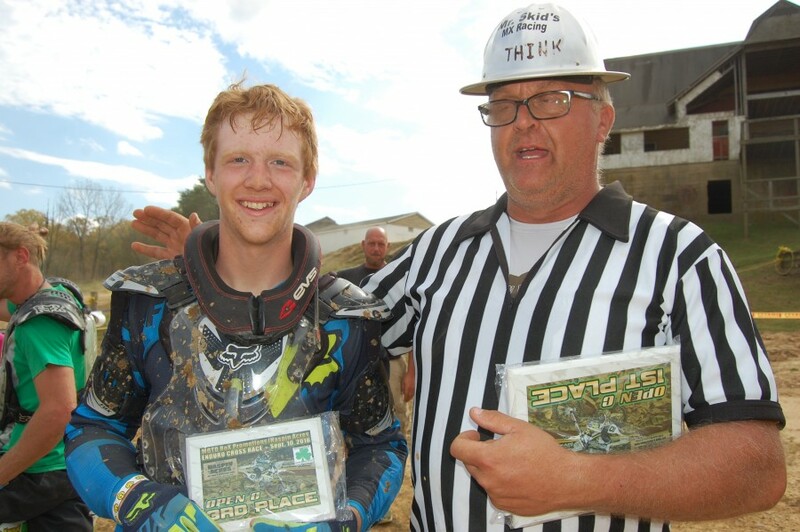 #711 Hank Brock placed 5th in today's Enduro Cross race! 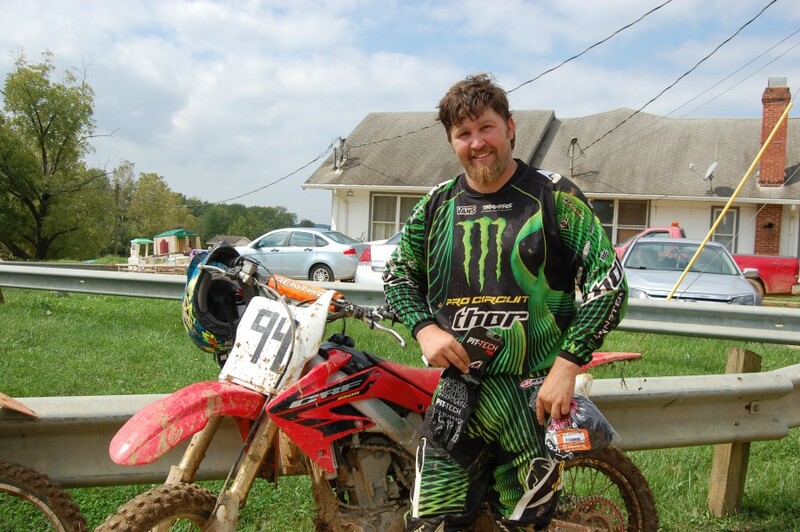 #94 Steve Rainey placed 6th in today's Enduro Cross race! #23 Ryan Barber placed 7th in today's Enduro Cross race! 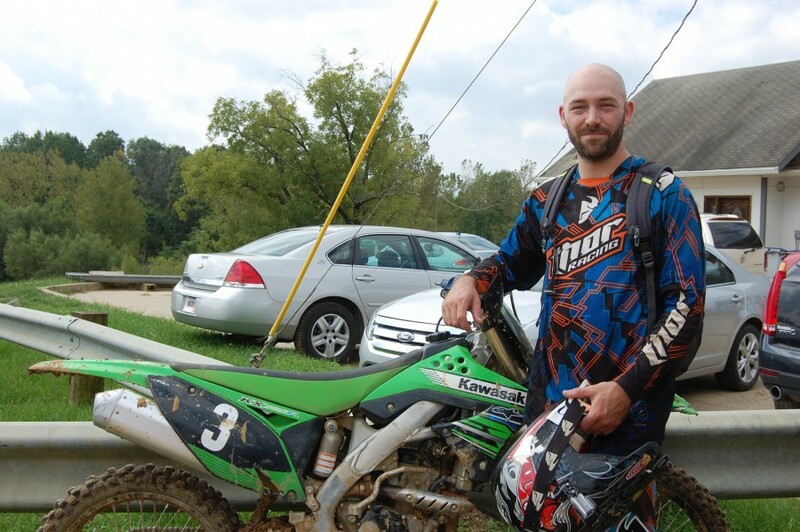 # 3 Chad Christy placed 8th in today's Enduro Cross race! Chris Amburgy with his sweet ride! 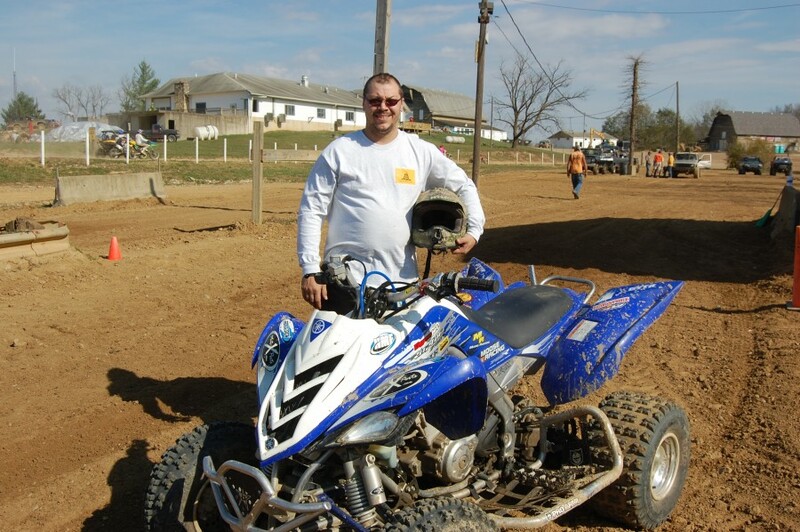 Chris Amburgy won 1st Place in the 1000 Class of today's UTV race! Anthony Morgan with his prize winning ride! 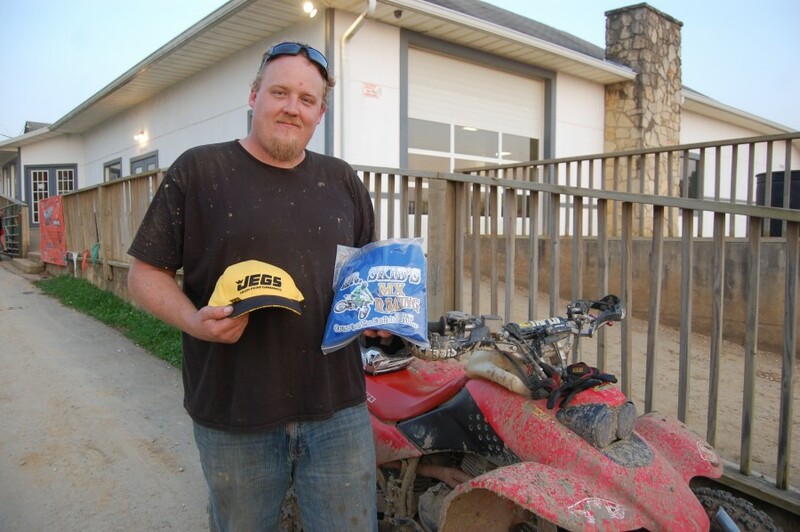 Anthony Morgan won 1st Place in the 900 Class of today's UTV race! 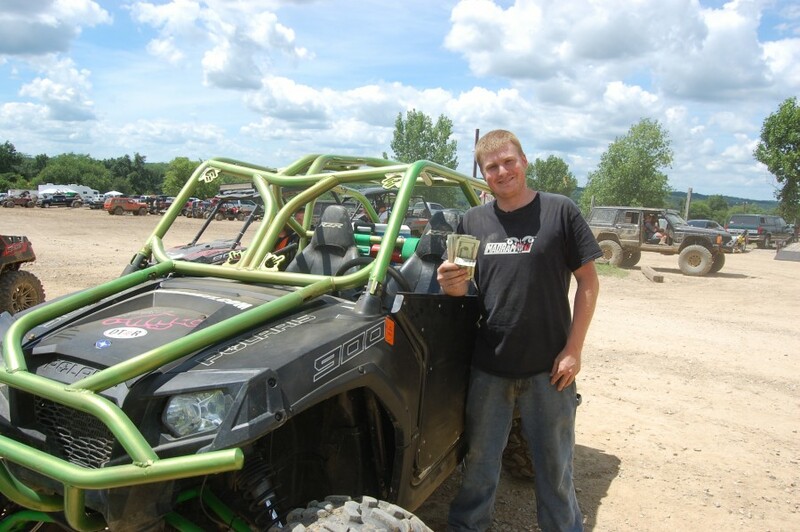 Tyler Stringer won $20 in today's UTV race! 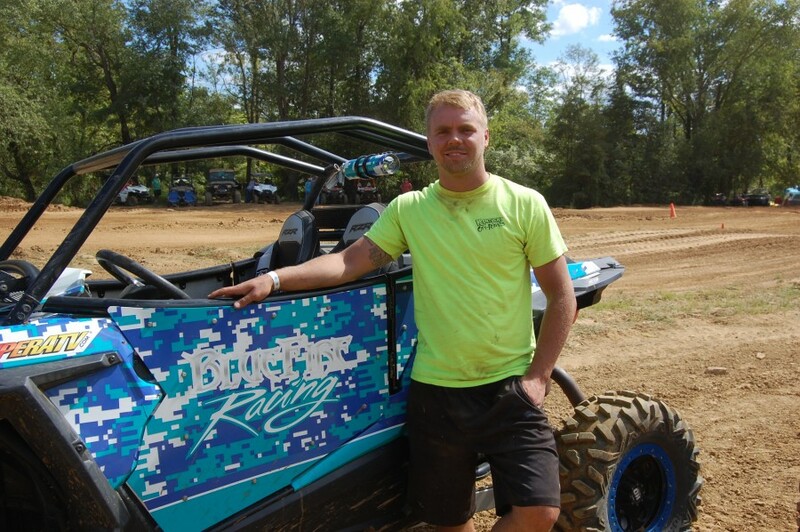 Tyler Stringer won 1st Place in the 800 Class of today's UTV race! Dan Dodge with his prize winning truck! 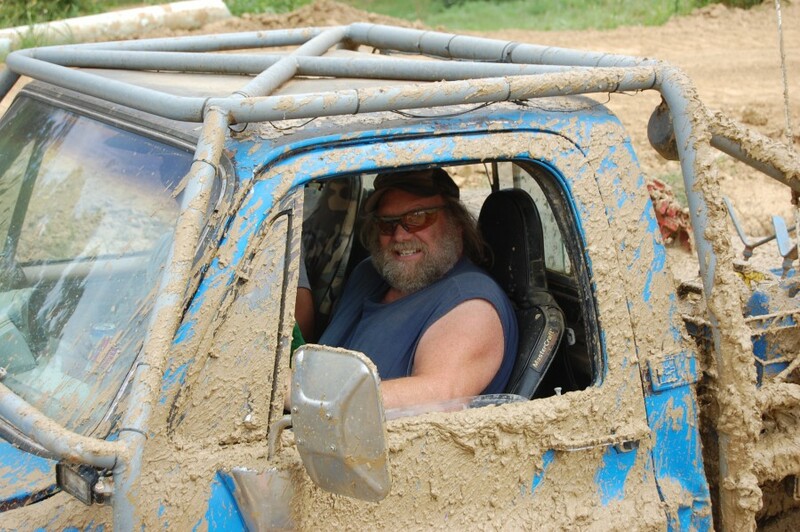 Dan Dodge won 1st Place in two different categories of our Mud Bog Race today! 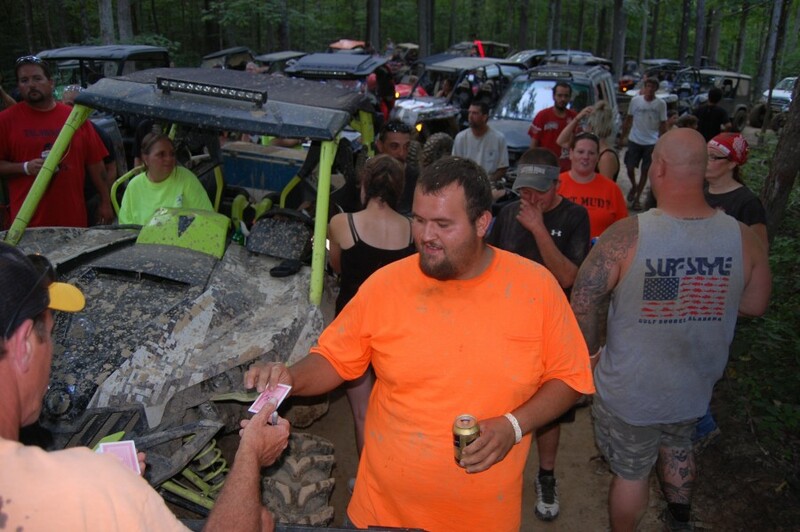 He won $90 CASH in the Jeep/Truck Class and $80 CASH in the Winner Take All Run Off for Trucks! 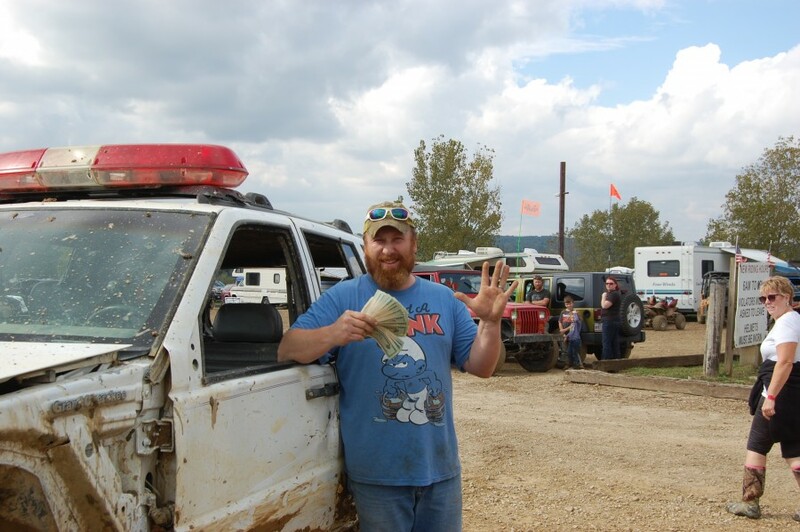 Jason Hamric with his prize winning quad and his cold, hard CASH winnings! 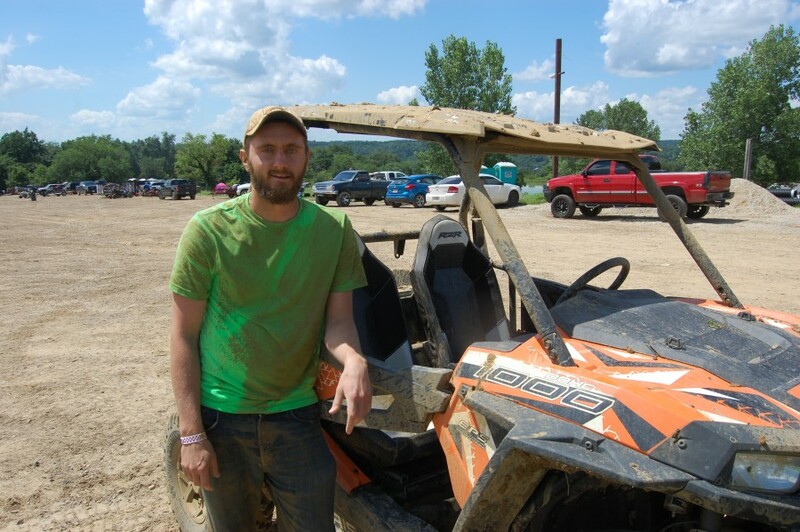 Jason Hamric won 1st Place in the Quad Class of our Mud Bog Race today! 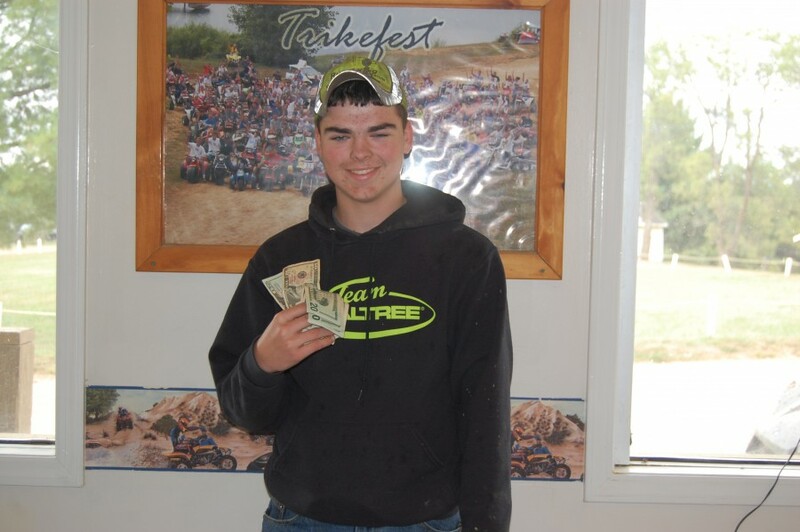 Tyler Roberts with his rig and CASH winnings! 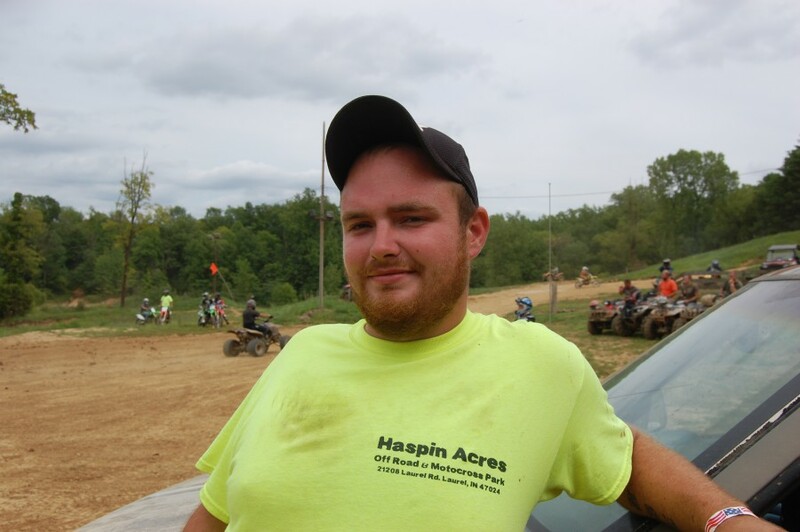 Tyler Roberts won 1st Place in the UTV class of our Hill Climb Race today with a winning time of 19.32 seconds! Al Petty with his prize winning bike and his prize winnings CASH! 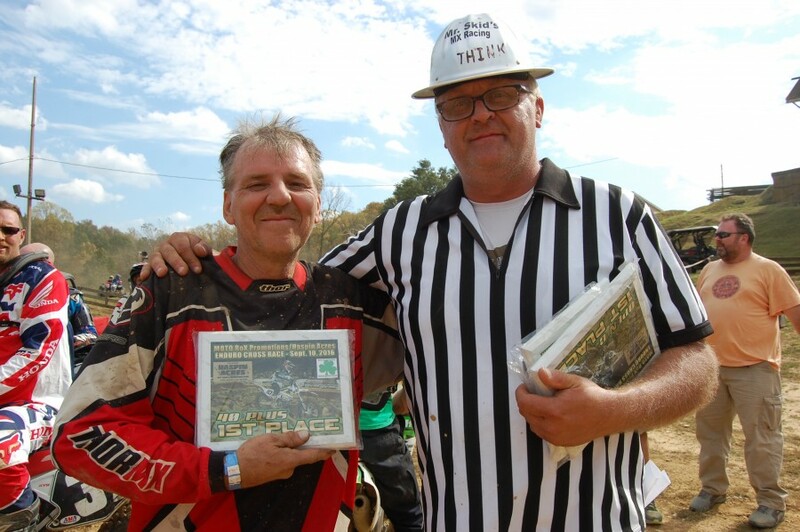 Al Petty won 1st Place in the Bikes class of our Hill Climb Race today with a winning time of 20.77 seconds! Brian Lairmore with his rig and his cash prize winnings! Brian Lairmore won 1st Place in the Stock Jeeps class of our Hill Climb Race today with a winning time of 22.17 seconds! 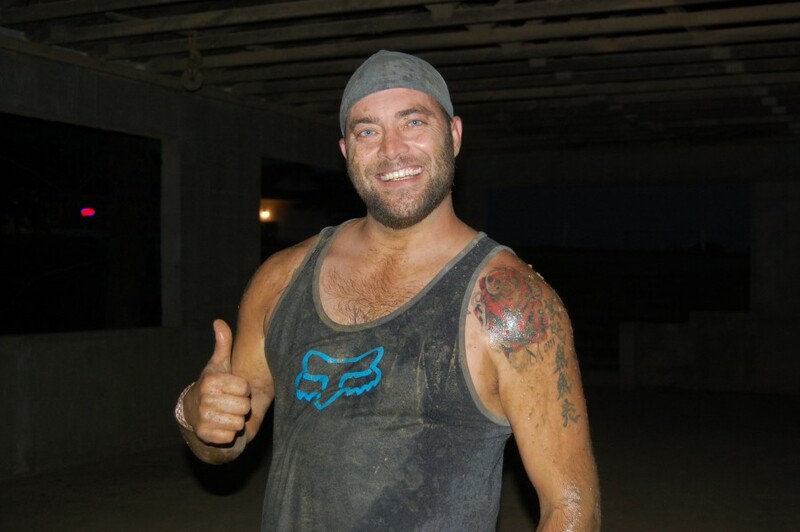 Danny Dodge has a huge smile on his face after winning $180 in our Mud Bog Race tonight! Danny Dodge is THE MAN! He was the ONLY driver out of 18 to make it all the way across the Big Dog "Eliminator" mud pit tonight in our Mud Bog Race! 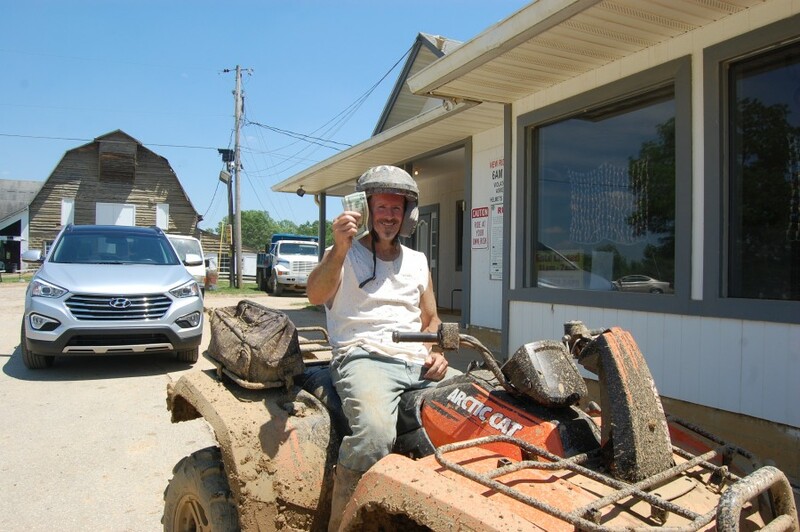 Isham Peace with his winning ATV! Isham Peace won 1st Place in the ATV class of our Mud Bog Race tonight! 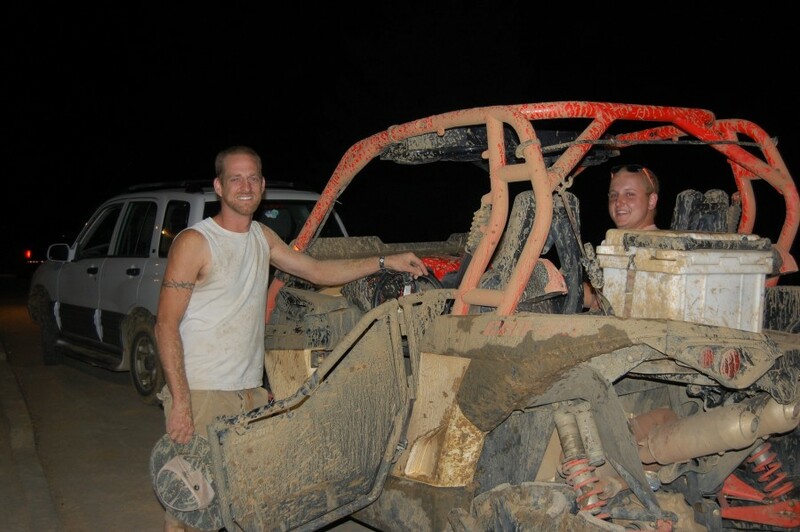 Travis Rieckers with his winning UTV! 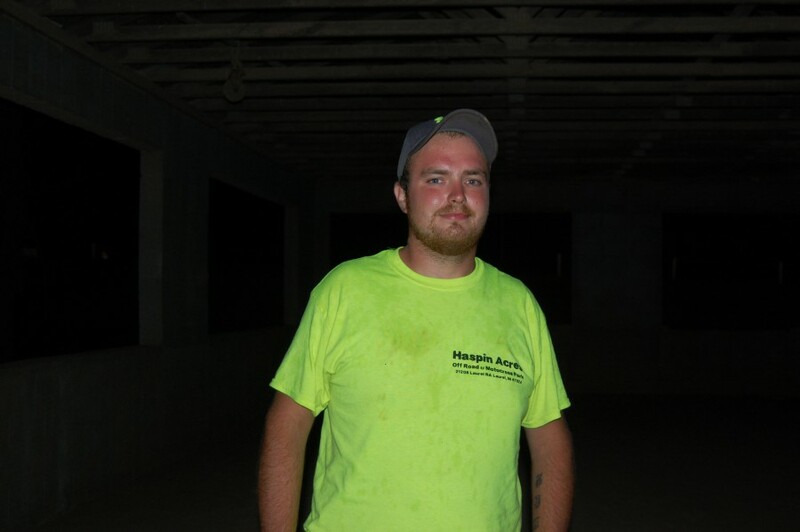 Travis Rieckers won 1st Place in the UTV class of our Mud Bog Race tonight! 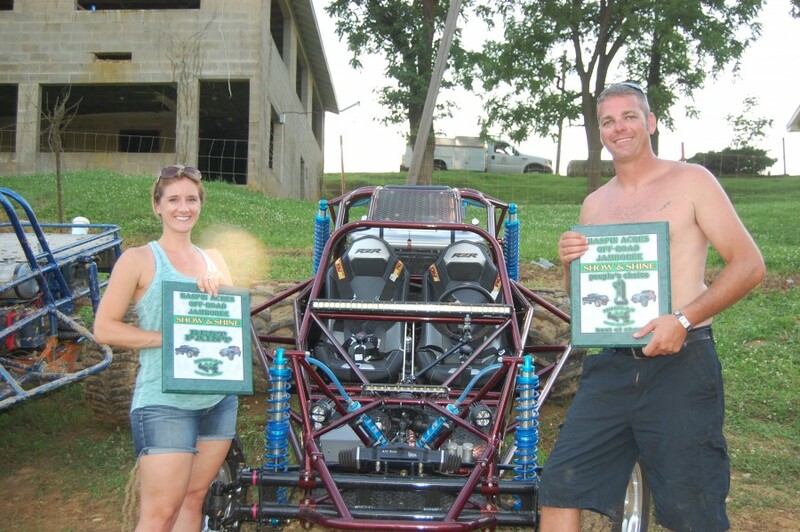 Travis Gray with his lovely lady, his sweet ride, and his 2 Show & Shine awards! Travis Gray was a double winner in our Show & Shine Contest tonight! He won the "Best Paint" award and the People's Choice "Best of Show" award for his sweet looking ride! Congratulations, Travis! James Champer's cool looking, zebra style ride was voted People's Choice for "Best of Show"
James Champer won the People's Choice "Best of Show" award for his awesome, zebra style ride! Congratulations, James! Jason Compton with his badass ride and his "Best Mechanical" award! Jason Compton won the "Best Mechanical" award in our Show & Shine Contest tonight with his super awesome 1,000 horsepower truck! Congratulations, Jason! Brian Lairmore with his cool ride and his "Best Suspension" award! Brian Lairmore won the "Best Suspension" award in our Show & Shine Contest tonight! Congratulations, Brian! 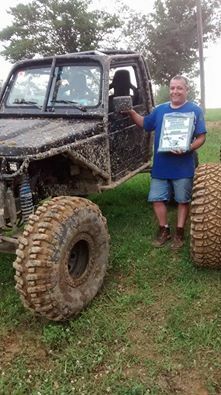 Anthony Neukam with his Mud Bog Race winnings! 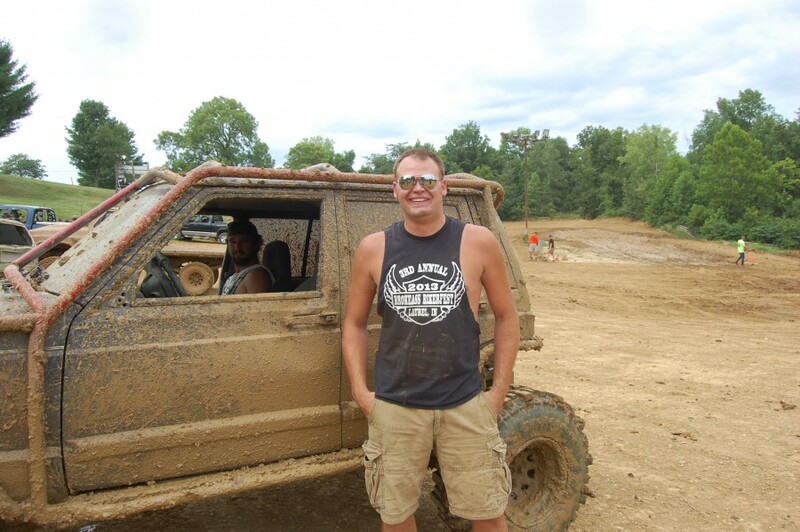 Anthony Neukam won 1st Place in the Truck Class of our first mud bog race of the season! 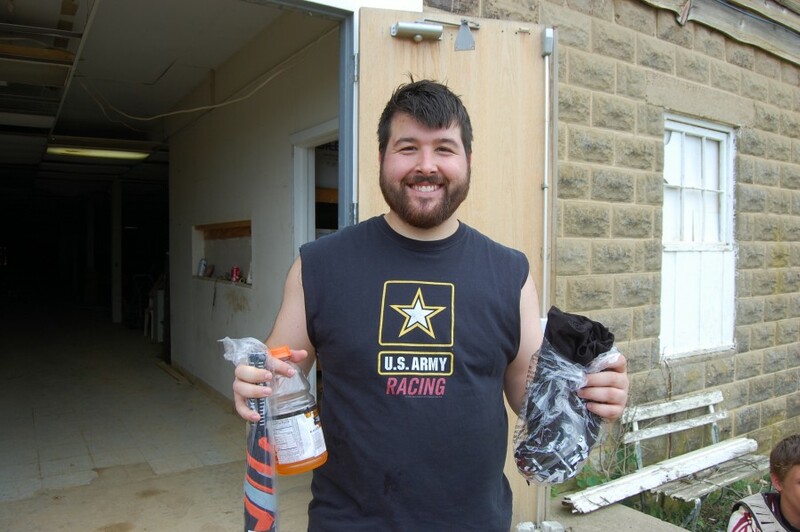 Devin Winner with his Mud Bog Race winnings! 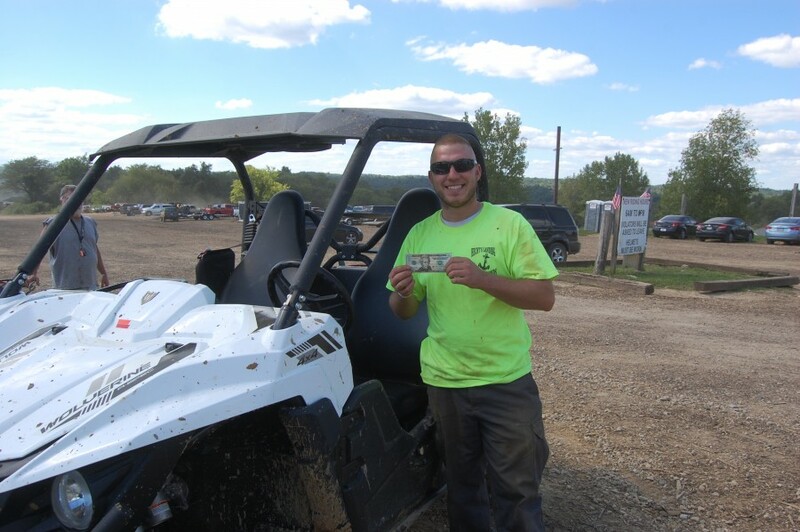 Devin Winner won 1st Place in the UTV Class of our first mud bog race of the season! 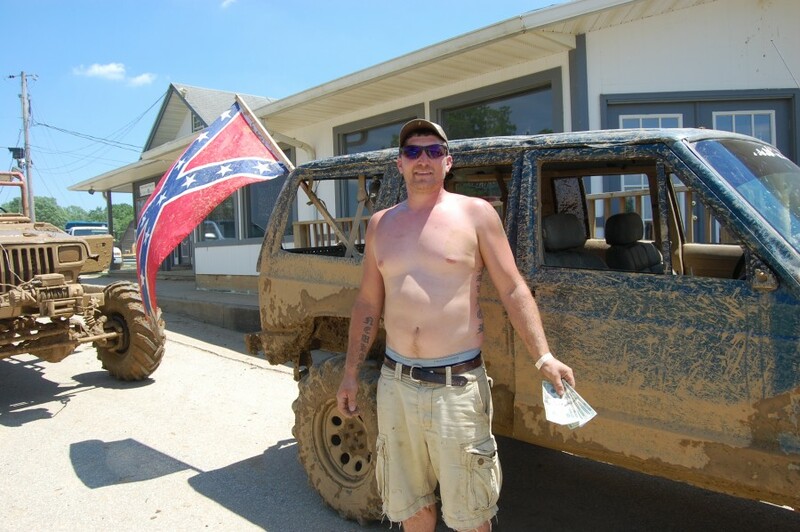 Elmo Thomas with his Mud Bog Race winnings! 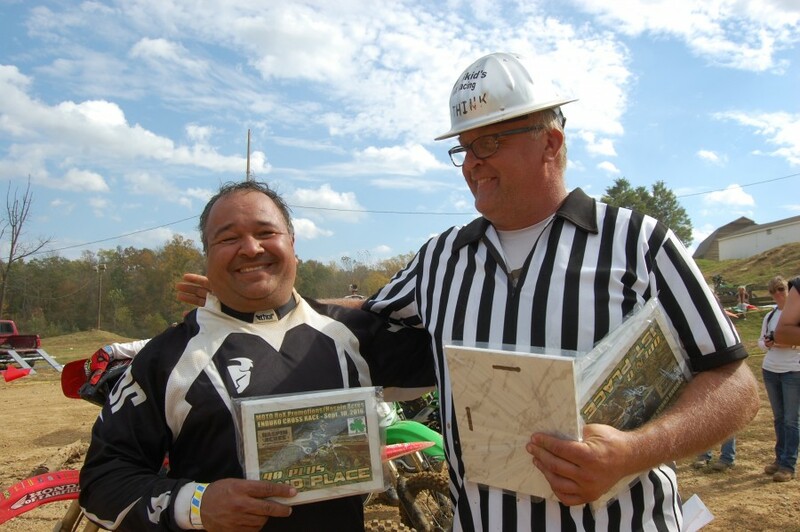 Elmo Thomas won 1st Place in the Quad Class of our first mud bog race of the season! Matt Barbour won 1st Place in the Open Class of our Hill Climb Race! Demi McBride won 1st Place in the UTV Class of our Hill Climb Race! Michael Meador won 1st Place in the 800 Class of our UTV Barrel Race! 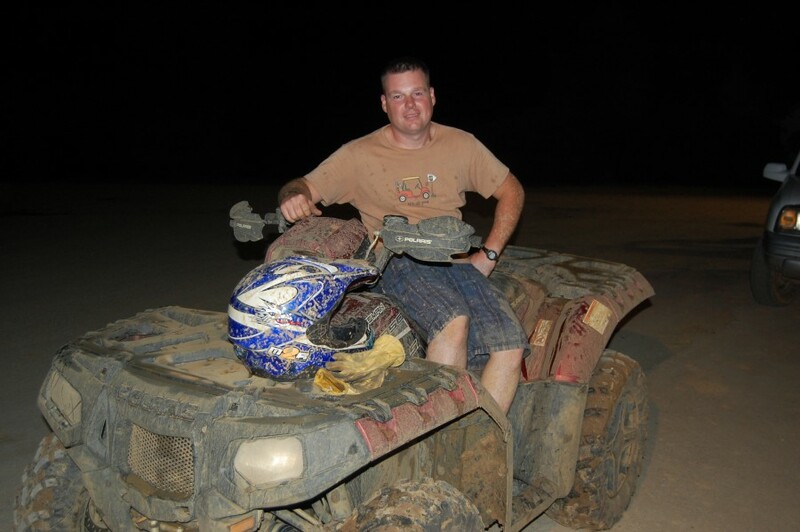 Michael Meador won 1st Place in the 800 Class of our UTV Track Race! Michael won $60 in COLD, HARD, CASH! 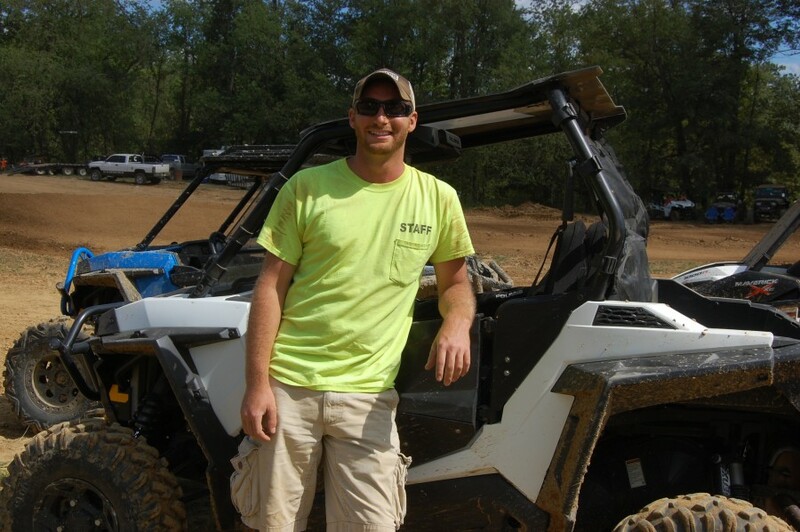 Brian Meador won 1st Place in the 900 Class of our UTV Track Race! 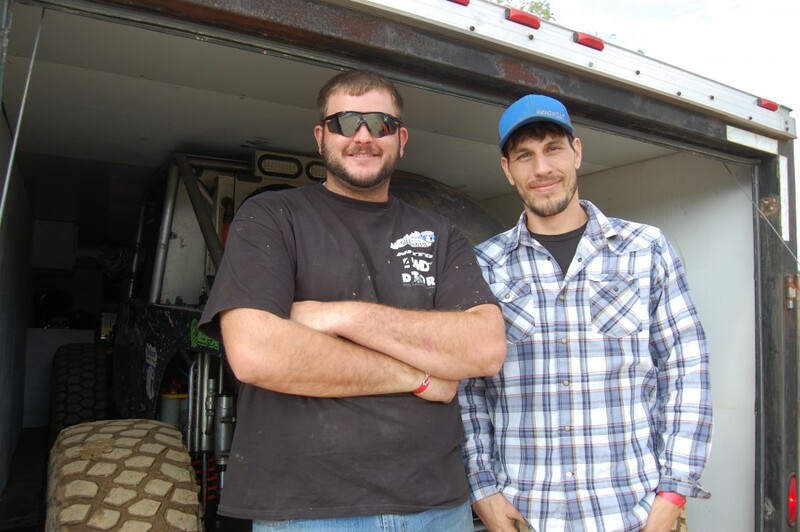 Trae Lakes won 1st Place in the 33" and below tire size Truck Class of our Mud Bog Race! Trae has won 1st Place in this class in EVERY mud bog race we have had this season! He's the MAN! 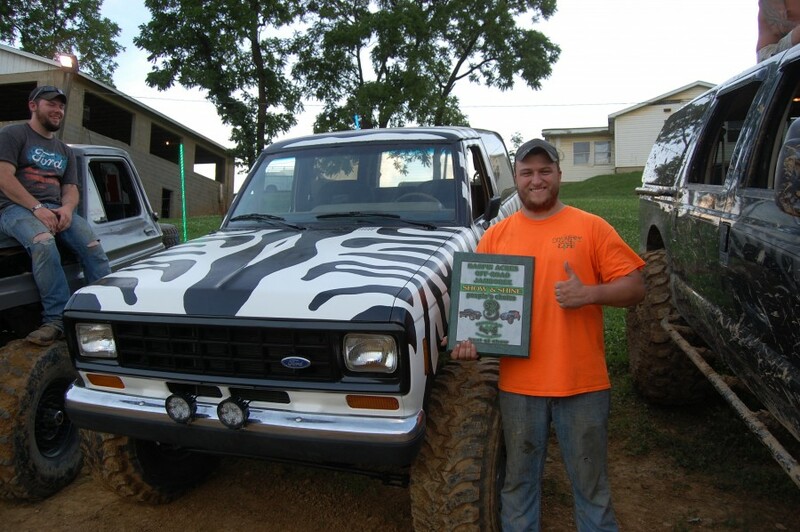 Josh Baker won 1st Place in the 35" and above tire size Truck Class of our Mud Bog Race! 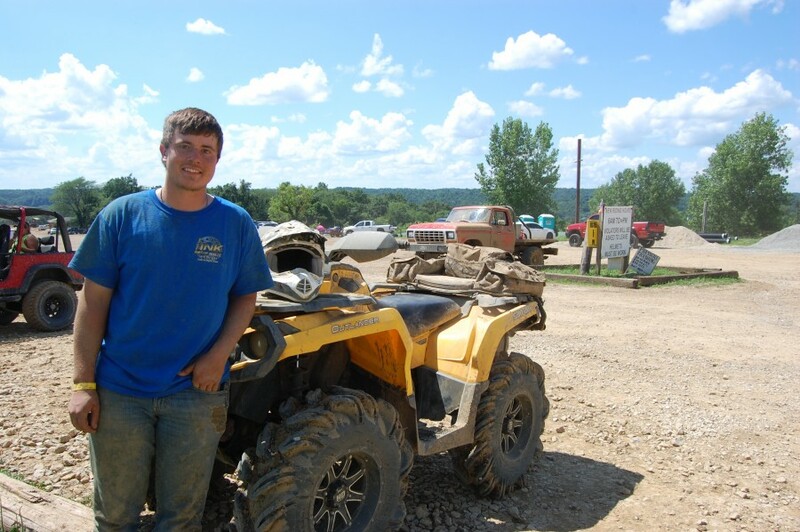 Josh White won 1st Place in the Quad Class of our Mud Bog Race! 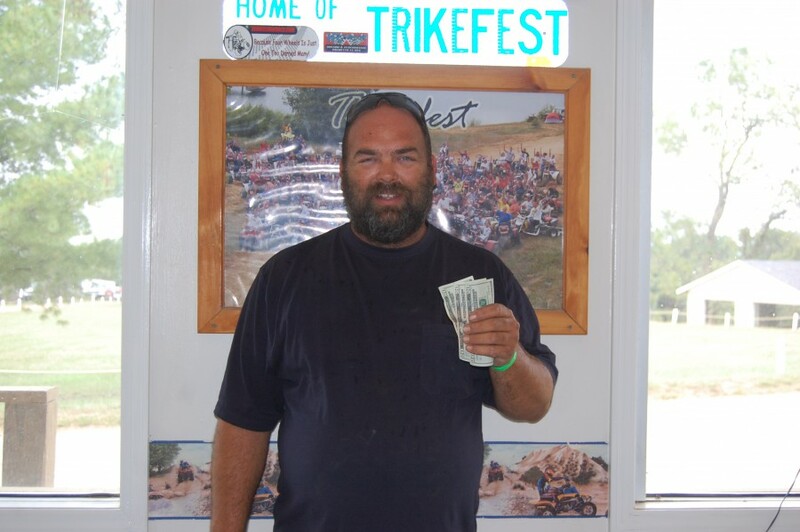 Shane McCrady collected the best Poker hand and won $520 CASH in our Jamboree Weekend Poker Run! 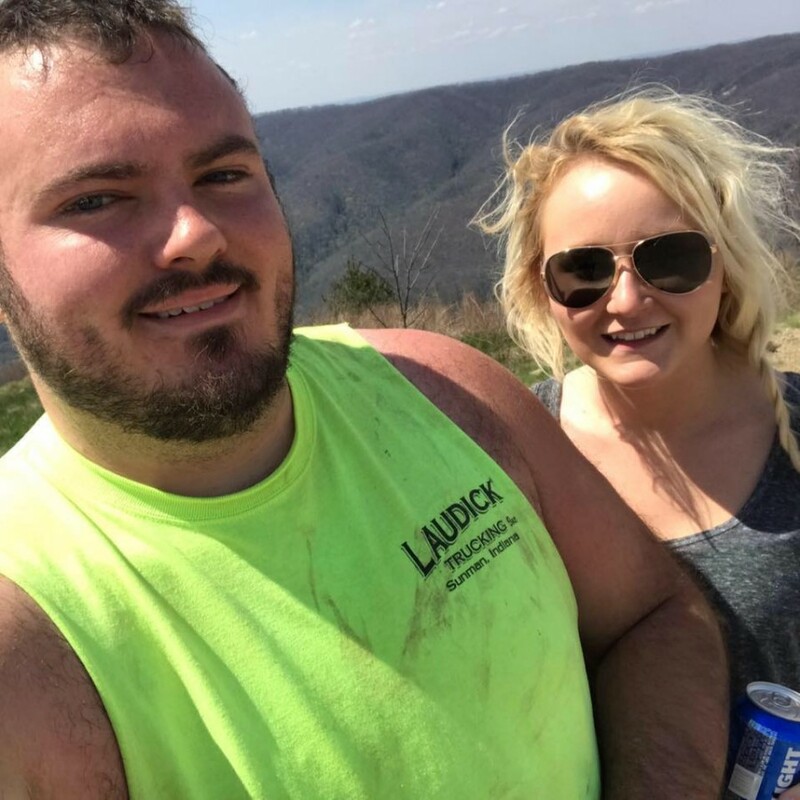 Amber McCrady had all the other contestants eating her dust when she raced like a boss to win 1st Place in the UTV Class of our Hill Climb Race! 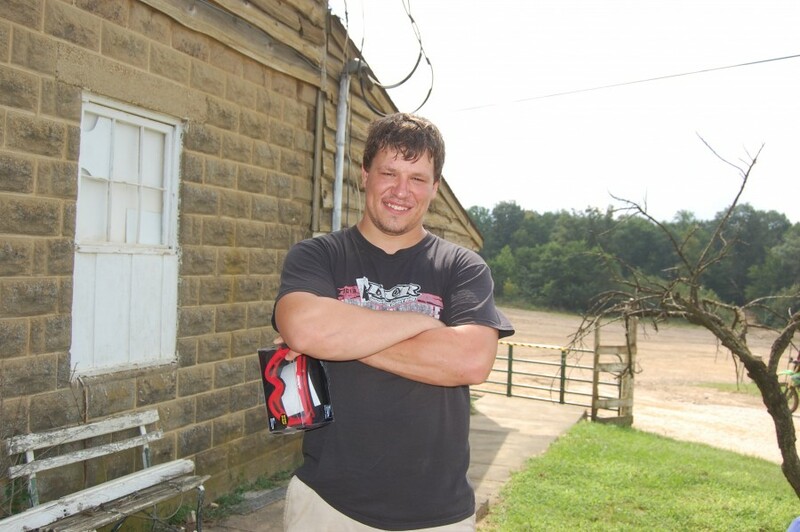 Mike Shewmaker won 1st Place in the Truck Class of our Hill Climb Race! Mike won $30 CASH and the honor of naming the hill! Mike has chosen to name it, "Khaos Hill!" Aptly named, Mike! Nelson Frost won 1st Place in the Quad Class of our Hill Climb Race! 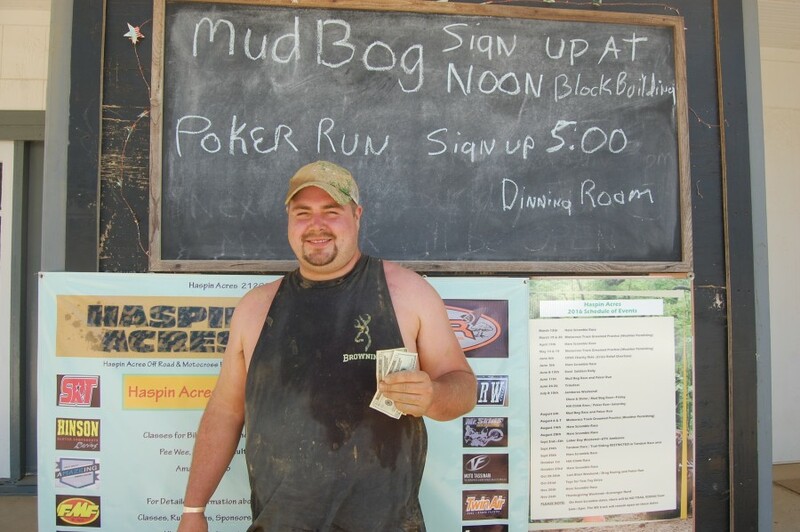 Jeremy Gibbs won 1st Place in the Quad Class of our Mud Bog Race! This kind and generous young man donated his cash prize winnings to the Children's Christmas fund! Not only is he a winner, he's also a hero! Congratulations and Thanks, Jeremy! #‎CutiePieSweetheart‬!!! 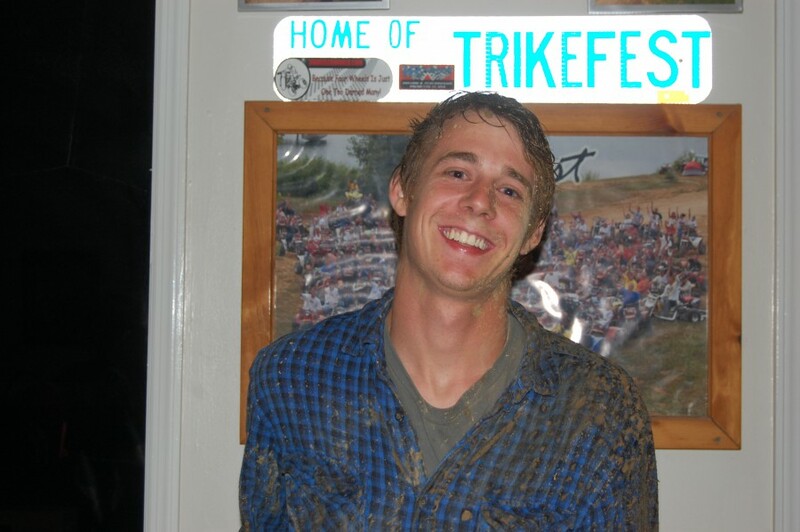 Trae Lakes won 1st Place in the 33" and below Tire Size Class in our Mud Bog Race! 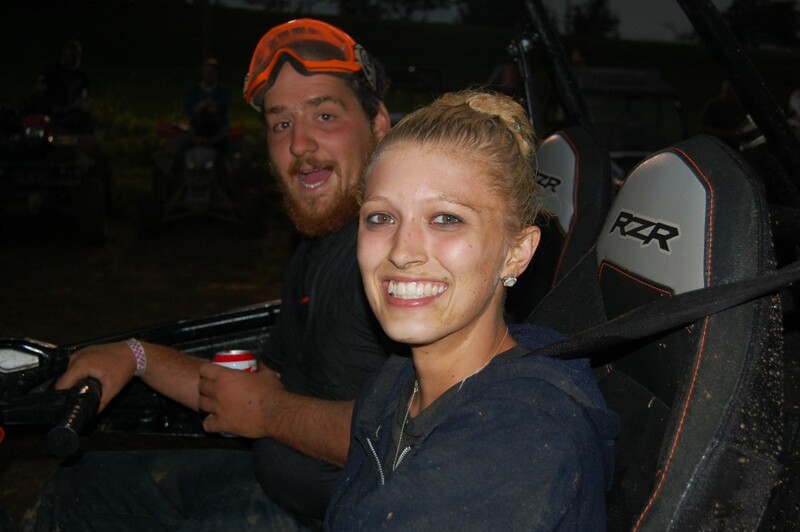 Jamie Jagnecki won 1st Place in the UTV Class driving her cute little RZR 1000 in our Mud Bog Race! 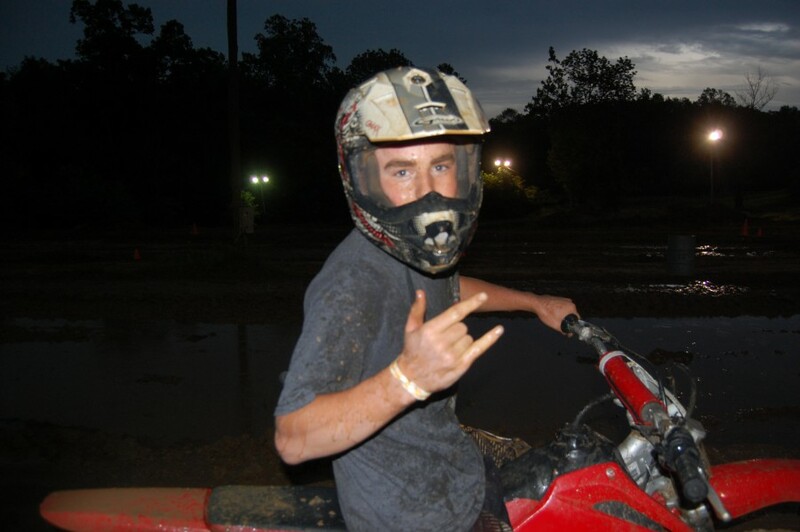 Trenton Glaze won 1st Place in the Bike Class on his Honda 230 bike in our Mud Bog Race! 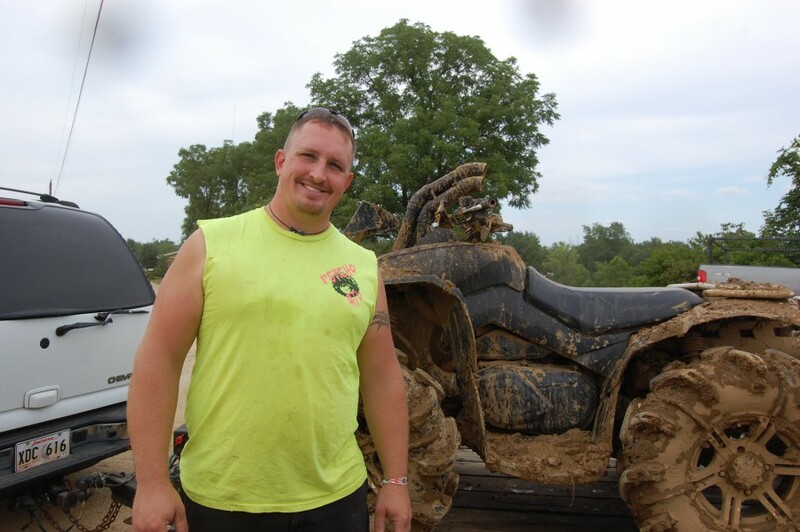 Troy Marksberry won 1st Place in the 35" and below Tire Size Class in our Mud Bog Race! He won a total of $420!